Order within the next... 0 hours, 14 minutes, 56 seconds ...for dispatch today! Presented with a walnut and maple board. 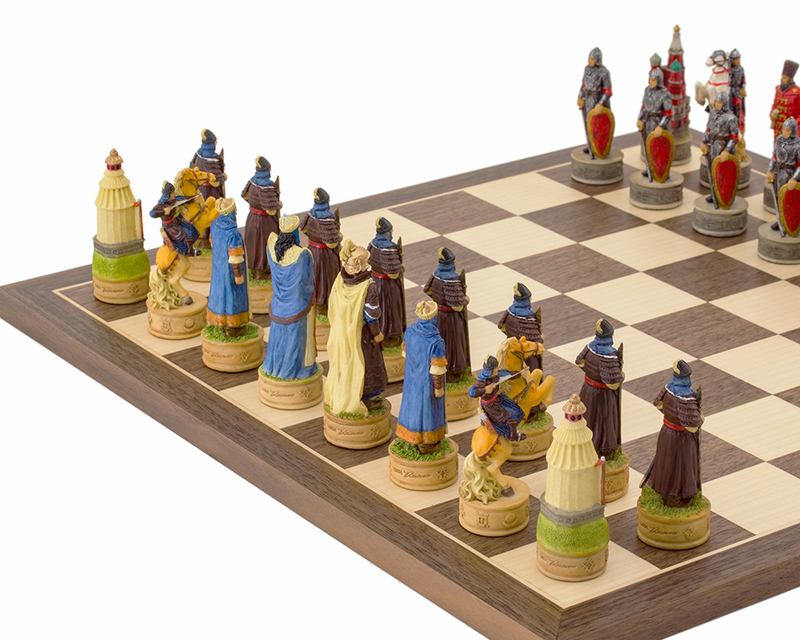 Set upon a 15.75 inch Spanish board made from walnut and maple, these chess pieces are superb in their detail. 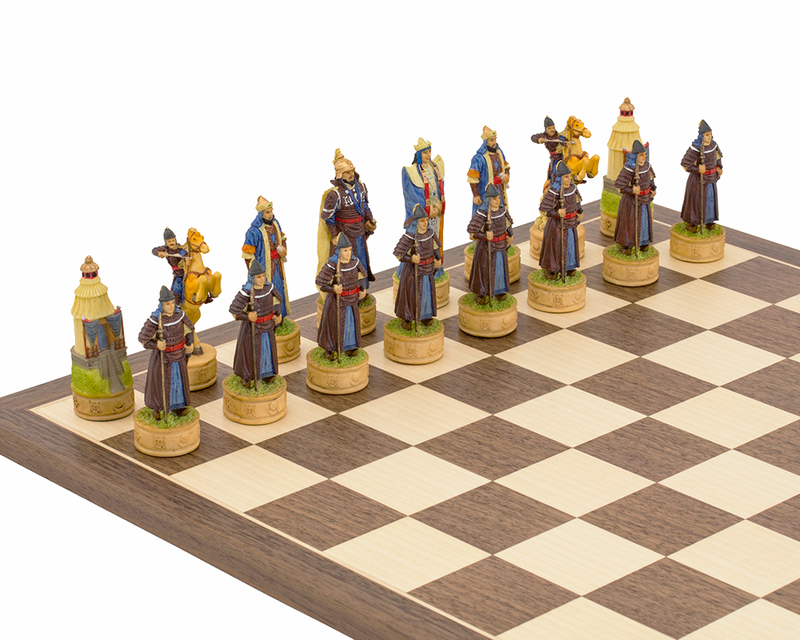 An instantly recognisable Genghis Khan, with his flowing robes, helmet and facial features, leads The Mongolian Army who are resplendent in their traditional dress. His Queen is elegantly regal in her costume, and the tribesmen very threatening with their decorative shields and spears. 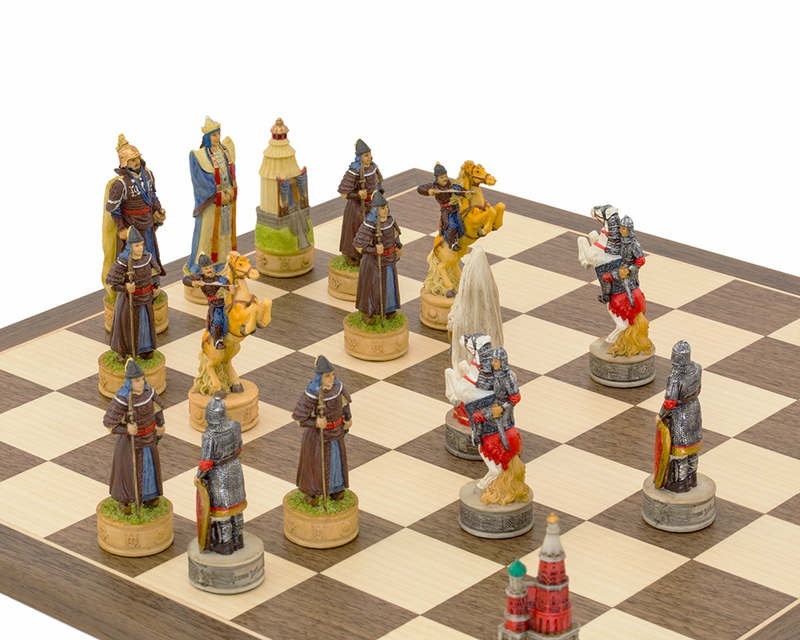 However, Italfama gives us a outstandingly creative rook in the form of stunning miniatures of the ger (or yurt), the tent-like dwelling of the Mongolian people. 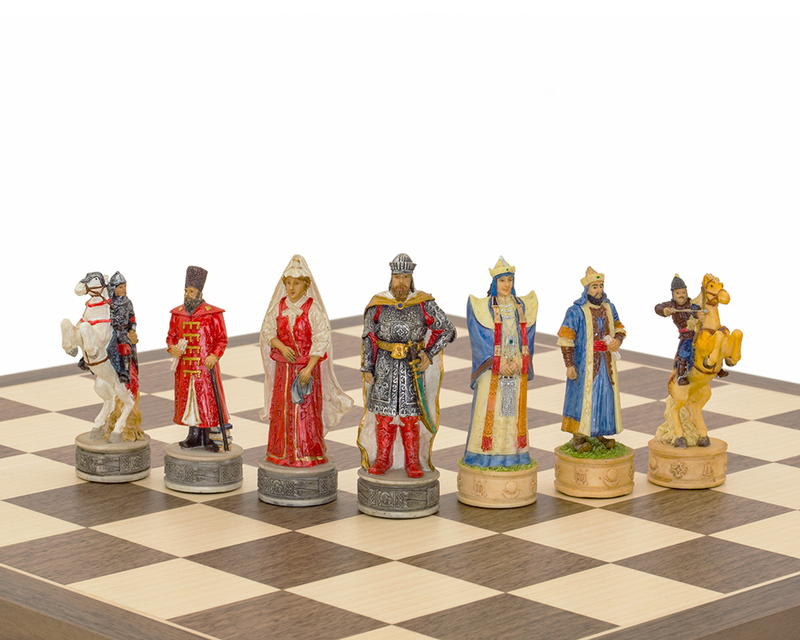 The Russian chessmen are traditionally dressed in typically Russian costume, from the tall burly King to his elegantly robed Queen and the Cossack bishop. Even in the chain mail worn by the pawns and knights, the detail is incredible. 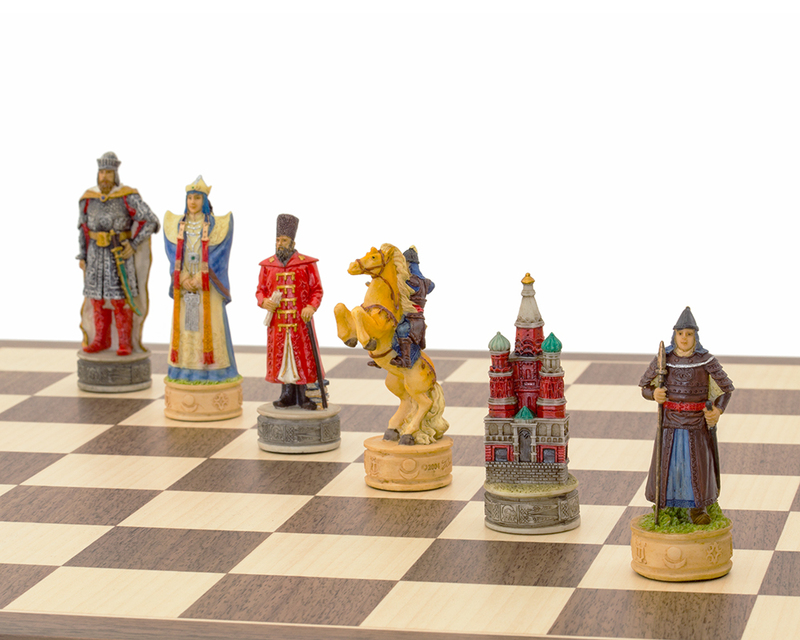 The onion-domed dwelling, depicting the rook, is a perfect miniature of Russian architecture at that time. 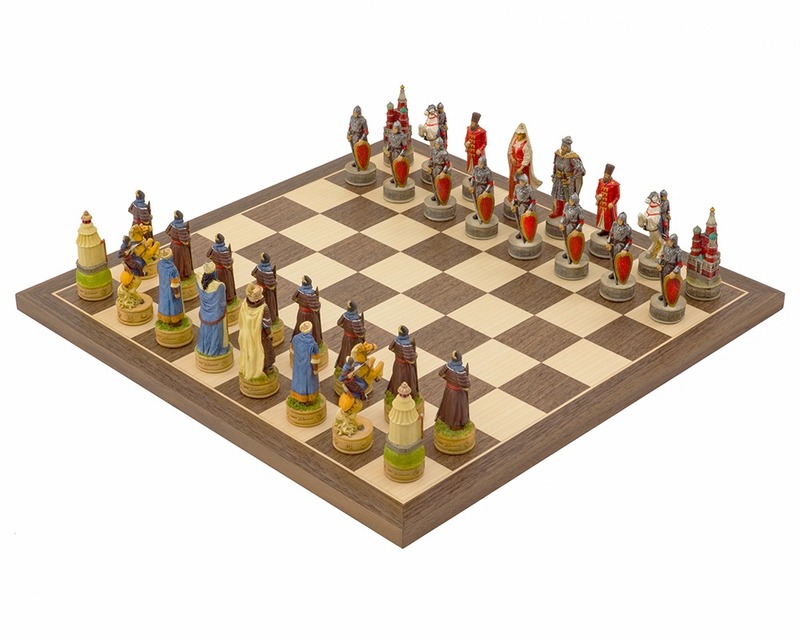 The Russians v Mongolians Chessmen are also available without the board. Either way, this is a perfect set for someone interested in historical events. Following the successful invasion of the Caucasus in 1221 and a small section of Russia in 1222 the Mongol rule over Russia was accelerated and lasted nearly 250 years. Under the orders of Genghis Khan, generals Jebe and Subotai, marched through the perilous Caucasus Mountains, into Russia. Following a series of assaults and tactical manoeuvres, they seized the upper hand and ordered an all out attack on the Russianas. Ultimately, Prince Mstislav of Kiev capitulated provided they would remain unharmed on their return to Kiev. He was executed and his men slaughtered. Cities were levelled and populations exterminated during further conflicts that took place over the years. Some 15 years after the death of Genghis Khan, the Mongolian Army had control over all of Russia and Old Sarai became the head quarters of the Mongol authority. Referred to as the Golden Horde, their control endured for almost 250 years.